To really understand the big picture of nanotechnology, it is helpful to review the timeline of discoveries that brought us to the current understanding of the science. The history forms the foundation to understand the current state of the science and commercial potential. A pioneer in the development of nanotechnology was Eric Drexler. While still a student at MIT, Drexler outlined the fundamental bottom-up approach to nanotechnology in which he described how one might manipulate individual atoms and thereby synthesize materials. Drexler suggested that machines smaller than individual organic cells could be created. He called these nanorobots. He predicted that these cell repair machines could be infused into a person’s bloodstream to cure diseases or released into the air to eliminate pollution. His book, The Engines of Creation: The Coming Era of Nanotechnology, published in 1986, is a seminal text in the field. He was also the first person to be granted a PhD in Molecular Nanotechnology. In 1981, Gerd Binning and Heinrich Rohrer of IBM Zurich invented a machine named the scanning tunneling microscope (STM). The STM was built to image atoms, but it turns out, it can also move them. A famous demonstration of this came in 1989 when Don Eigler of IBM arranged 35 atoms on a surface made of nickel to spell out IBM. In 1985, between the introduction of the STM and the famous demonstration of how it could arrange atoms, a British chemist named Harry Kroto noted that chains of carbon atoms were present trillions of kilometers away in space. Kroto conjectured that these chains might have been created in the atmosphere of red giant stars. Around this time, Kroto connected with Richard Smalley and Robert Curl, American researchers at Rice University studying clusters of atoms that were generated when they vaporized metal or semiconductor samples. This trio got together when Kroto came to the states to use Rice University’s high-end equipment. To replicate the really hot conditions that exist in the atmosphere of a red giant star, they vaporized graphite. The procedure produced carbon molecules never observed before. They noted that the most common molecule contained 60 carbon atoms. Because the molecules seemed stable, Kroto, Smalley, and Curl guessed that they were spherical, because spherical molecules tend to be more stable. The three scientists finally determined that combining 60 carbon atoms in a spherical shape required interlocking hexagons and pentagons. The structure of a buckyball. They named this structure buckyball. 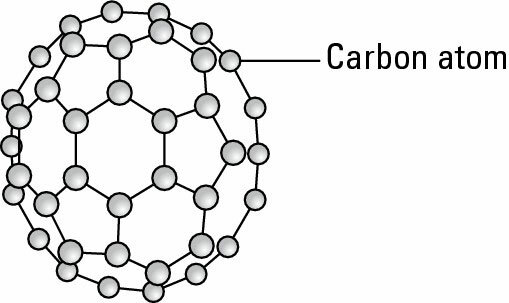 The buckyball is also sometimes called C60 for the 60 carbon atoms it contains. In 1991, came the discovery of tiny needles of carbon that run anywhere from 1 nm to 100 nm in diameter. These tubes are made up of carbon atoms connected in hexagons and pentagons like buckyballs but in a cylindrical shape. They were discovered by Sumino Iijima, who named them carbon nanotubes. Iijima examined some carbon soot under an electron microscope and realized that small cylinders of matter consisting of a lattice of carbon atoms appeared in the sample along with buckyballs. He realized that carbon nanotubes are buckyballs whose ends haven’t folded around to create a sphere. 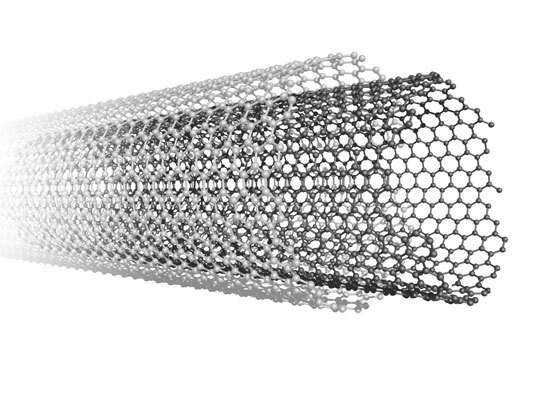 The structure of a carbon nanotube. Nanotubes come in two types: single-walled nanotubes (SWNTs) and multi-walled nanotubes (MWNTs). The SWNT forms a single layer cylinder and is the most commonly used type of nanotube. The MWNT is made up of multiple cylinders tucked into each other.